Well, the “Final Four Plan” is making for a sllllllow start to free agency for Vikings fans. To date, the Vikings have tendered all but one of their restricted players, re-signed a backup wide out, allowed Chester Taylor to leave for Chicago, and have been rumored to be interested in a cornerback with ACL issues. I wanted to take a minute to address a number of points regarding the Vikings offensive tackles. First, news has hit that Artis Hicks is drawing a significant amount of interest on the free agent market. He is scheduled to meet with the Redskins this weekend, and the feeling is that Hicks is viewed by a number of teams as a left tackle with starting potential. This view of Hicks stems from his time filling in for Bryant McKinnie when he has been suspended or injured or sucking really badly over the last few years. At the very least, teams know Hicks can handle the right tackle spot after seeing him fill in for Ryan Cook when Cook was sucking really badly. I was quite surprised that the Vikings didn’t find a way to retain Hicks prior to free agency starting given his level of play and ability to play four out of the five positions along the offensive line. At this point, the hope should be that Daniel Snyder falls head over heels for Hicks and decides to anoint him their next starter at left tackle and (over)pay him as such. This would increase the Vikings odds of landing a compensatory draft pick in 2011 (which is looking like an even better draft than 2010). Now, when it comes to Bryant McKinnie, the latest news is that his feet are feeling better and that he plans to go back to the “foot doctor” fairly soon. I continue to think that the Vikings should sign restricted free agent Jared Gaither of the Ravens to an offer sheet that the Ravens cannot match. They would be required to give their first round pick to the Ravens in exchange for the player, but that is a small price to pay for a proven-to-be excellent left tackle. Gaither comes with some risk, as he is penalty-prone and may struggle with zone blocking. First, let me say that our current tackles are not your prototypical zone blockers anyways. Second, at only age 24, Gaither will improve for quite a few more years when it comes to penalties and learning new techniques. Regardless of the possible risk, I think this is a great answer for the Vikings. 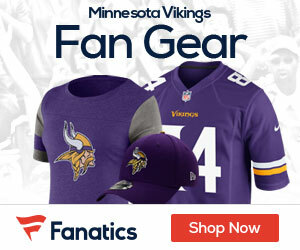 It is possible that by using the #30 pick on Gaither, the Vikings could actually IMPROVE their draft position by trading McKinnie to one of the top 29 teams in exchange for a first rounder… something that would not be too out of the realm of the possible. A chance to improve your left tackle spot and your position in the draft is something that should interest any team, and I would imagine the Vikings front office will at least consider a move of this nature. Given that McKinnie continues to prove he is a moron, I’d bet you a six pack that the Vikings P.R. department would be behind my plan 100%. That’s a great idea Adam. Even if we over payed for Gaithers, we get our value back in trading off McIdiot for picks or players. The guy is a dirtbag but he can play LT and that has some value. Adam you should be named the GM or something because you’re a genius. I loved this idea for quite some time, and as soo as we can get that distraction McKinne outta here the better. Adam, you dont like my security ideas? Dont be a stick in the mud like Freds. That guy is a real killjoy, so dont listen to him. it all depends on which players Brett gave Brad permission to go after!!!!! Hey! How you know that!?! I promise you there is not a team in the league that wants McKinnie at the money he is making, let alone for a 1st round pick. The only option would be to cut him, which makes this a less than ideal scenario. McKinnie’s contract is fairly old and outdated… for a “Pro Bowl” left tackle his $$ is not so bad anymore. A first may be a bit much, especially if Gaither is already on the roster, but something like a 2nd rounder and 7th rounder is more realistic. Heck, perhaps a 2011 first rounder? I’ve been thinking the exact same thing for quite some time. We really should at least attempt to sign Gaither to an offer. This guy is a beast.. and with the Ravens drafting Oher, they may actually be willing to take a 1st rounder is such a strong draft. We also could turn around and ship McKinnie to the Redskins (this moves makes way too much sense) and pick up their second round pick. Washington has huge holes at O-Line.. and Bryant McKinnie has Daniel Snyder written all over him. Agreed, I could see Snyder or Al Davis being enticed. Seahawks might be desperate enough as well. I really like Gaither… and to think he went in the middle of the Supplemental Draft… what a steal. After reading your last article on Gaither, I looked him up on ProFootballFocus.com and they score him as #6 Tackle in the NFL last year. This included his penalties. He is young, tough, and shows a lot of potential. He would be a great value a #30 overall. Conversely I don’t think any team would be willing to give a 1st rounder for McBonehead, especially if we had his replacement in house. It would be worth a try though. Don’t forget, he is a “Pro Bowl” left tackle. The fans weren’t the only ones to vote, so apparently some people in the league think pretty highly of him. It’d be a victory to get a first rounder for him, but don’t think it is impossible. With Hicks gone there is an opening on the offensive line. However, the Left Tackle is occupied at the moment. My “plan” would make O-Tackle less of a priority in the draft… giving the Vikes more freedom to take BPa or address other needs… letting the backup be more of a mid-to-late round selection. That is a silver (okay, more like copper) lining in all of this. Justin Fargas just got cut by the Raiders. Huggy Bear’s Boy is my new favorite HB option for the Vikings #2 spot. You don’t think much Ian Johnson or Albert Young, Adam? I always liked Johnson and kept looking for him to be activated and get some playing time. He’s not ideal size for a third down back but he’s no lightweight either. I think he’s 6′ maybe 210#? I hate to see us have to waste a trade or a pick on a RB at this point. Especially now that Hicks is gone, that puts the need for the O-line right up there with DB & QB. I’d perfer us to pick up a RB in the later rounds and concentrate on our DB and OL needs first. To the contrary, Fran, I really like them both and would be fine with having them back up adrian. We need draft picks especially with a good draft class coming in, so just trade McKinne and get something for him after a “Pro Bowl” year. Agree Vike need one position in Free Agency so as not to put too much reliance on draft picks. There are three key positions to fill-CB, OL and RB. RB would be least pressing with the talent available internally and externally. Harvin could also see more backfield playing time. IF CB would expect the 1st rounder to start at least as 5th DB. If an OL then I expect there would be some competition for a spot. What if, Vike decided to select a QB in 1st round? I really love your plan Adam. Get Gaither and get rid of Bryant “my feet hurt” Mcweeny. Letting #29 go was a very risky move. If the Vikes don’t replace him with someone like, say, Darren Sproles (is he still looking? ), they are in trouble. And Dayyuuuummmm, I sure hope they are reading, GET A SECONDARY! I love the Gaither plan but doubt we’ll even make him an offer. They won’t want to risk not getting him and have McKinnie pout all year. It would be a good time to break out the old poisen pill contract and get it done. Fargas would be OK but I like the guys we have or Mike Bell. We definatly need a corner.